Admittedly, I’m not usually a fan of most Weight Watchers products..I just don’t find most of them to to be tasty enough for my picky palate :). But on a whim, and shopping while hungry (I know, I know…but I was at Walmart…that doesn’t really count), I decided to pick up their new, reduced fat flavored cream cheese spreads. I have tried their other flavors in the past and didn’t really like them very much, but now they have a Whipped Chocolate Cream Cheese Flavor and a Whipped Chocolate Raspberry Cream Cheese. So, I had to get them. Chocolate Raspberry anything gets me every time. But whoah….whoah!! They were really, REALLY good! I spread some of each flavor onto a slice of low calorie toast, and I was surprised by how much I truly liked them. They were sweet and flavorful, and didn’t have that artificial taste I was expecting. And at just 2 Points per serving, these delicious flavored cream cheeses are the perfect way to satisfy your sweet tooth for just a handful of Points. Use them as a dip for fruit or pretzels…or as a spread on toast or bagels. In fact, I may have to find a way to incorporate them into some yummy Weight Watchers cheesecake recipe! I definitely recommend giving these a try…they were excellent! Use it as a dip, as a spread, or just eat off the spoon (no judging! ), but however you choose to enjoy new Weight Watchers Whipped Reduced Fat Chocolate Cream Cheese Spread or Weight Watchers Whipped Reduced Fat Chocolate Raspberry Cream Cheese Spread, you won’t be disappointed. Creamy and decadent, each 2 tbsp serving will cost you just 2 Points. It’s a great product to have on hand if your sweet tooth strikes — a tbsp or two on some fruit or toast will help satisfy your craving. And it’s a much lower Points option than downing a slice of cheesecake! I see many new possibilities for these low calorie flavored cream cheese spreads. Right now, I think they are only at Walmart…I’ve checked my local grocery stores and haven’t seen them there, but hopefully they’ll be in more stores soon! 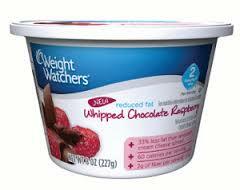 I have tried Weight Watchers whipped chocolate raspberry cream cheese and absolutely love it! I bought it at the Wal-mart in Gloucester, Va in the last but recently can’t find it anywhere! I have tried several different chains in different localities and have had no luck. Help! Where can I find it? where can I find these, never saw them before. Are they NEW?